Toss brussels sprouts in a mixing bowl with olive oil, salt, pepper, and 1 Tbsp of vinegar. Line a baking sheet with parchment paper and spread brussels out evenly across the surface. 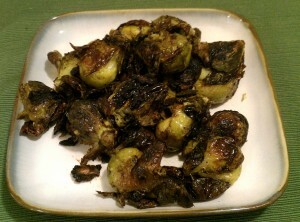 Roast for 20 minutes in oven, then remove brussels, toss, and roast for 15 more minutes. Remove from oven and place brussels in a serving dish. Drizzle remaining Tbsp. vinegar over the top.